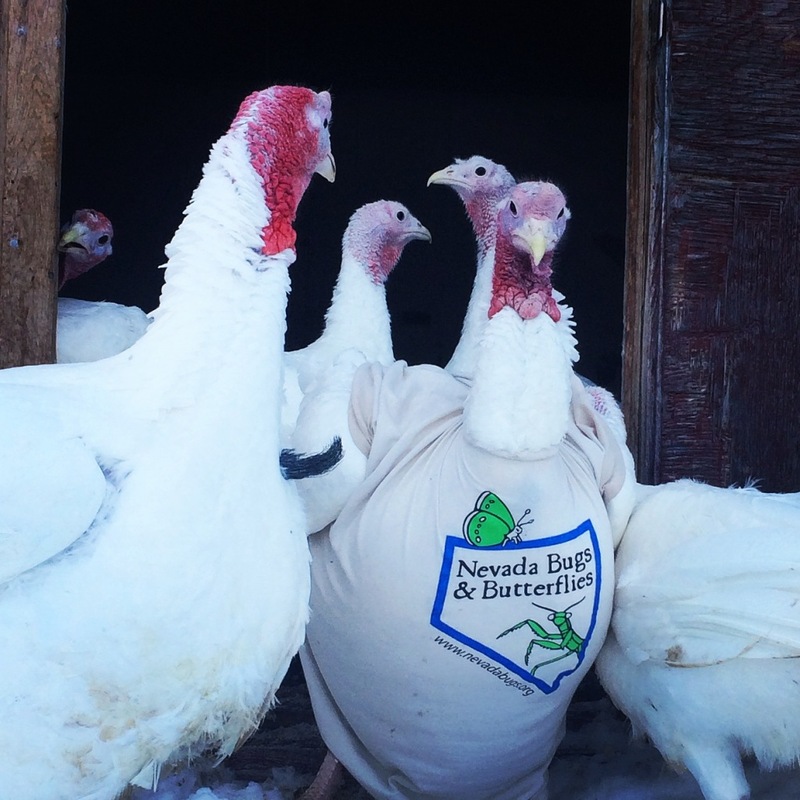 On behalf of Nevada Bugs and Butterflies, Cynthia and Kevin, and our board of directors, we’d like to wish all our visitors, volunteers, and donors happy holidays and offer a heartfelt thank you for all your support throughout 2014! Thanks to your generosity, we sold 141 t-shirts during our recent fundraiser, raising a total of $1488 and putting a fantastic finish on an already amazing year. We are proud to use this money to provide hands-on experiences with science and living things throughout the year, and we are excited to meet many new families in 2015. If you didn’t get a chance to donate by purchasing a t-shirt, it’s not too late to make your end of the year contribution. It’s now easier than ever to donate- you can donate securely online using PayPal directly from the Support Us page of our website. 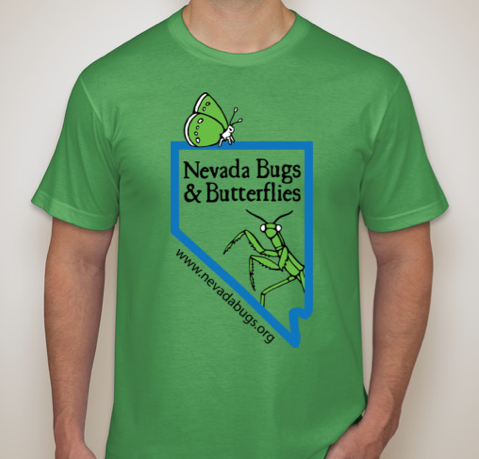 Checks can also be mailed to: Nevada Bugs and Butterflies, PO Box 21484, Reno, NV 89515. We received our 501(c)3 federal non-profit status in October, meaning your donations are tax-deductible. Your financial support continues to be the heart of our success at the butterfly house, and we encourage you to help us extend our reach in the coming year with your donation. See you in the summertime! Each time we set out a fundraising goal, we are surprised by the generosity of our amazing supporters, and this time was no exception. In just over two weeks we sold 141 of our logo t-shirts and received numerous additional donations, raising a total of $1488! 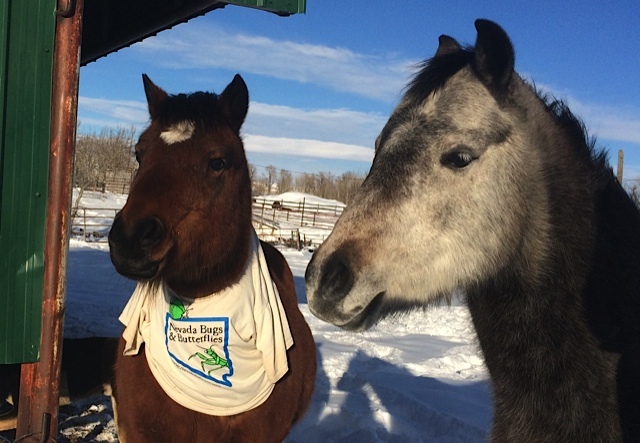 We are grateful to supporters both new and old, and can’t wait to see all those shirts around town in 2015. The money raised from this will go directly into funding the daily operation of the butterfly house next summer. These expenses include everything from supplies to care for our butterflies and create interactive activities at the butterfly house, to insurance and printing costs for our butterfly guides. During the fundraiser, we had a lot of fun dressing up some different characters in Nevada Bugs t-shirts, and we put these up on Facebook. But, for posterity, we thought we’d put a few of them up here too. Thank you again, and enjoy! 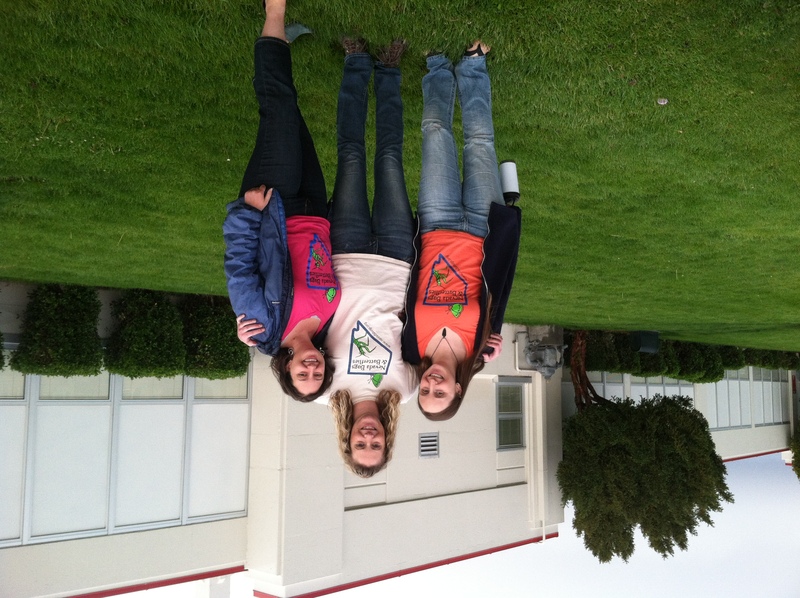 Our shirts go well with mountains! 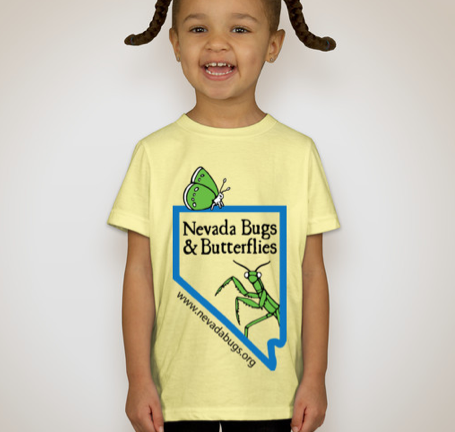 2014 was a big success for Nevada Bugs & Butterflies: in one season alone we quadrupled the number of visitors to the Butterfly House & Science Center! Besides welcoming 884 visitors to the butterfly house, we also connected with 2,814 budding scientists who joined us at outreach events held in local schools, libraries, and museums. We’re asking for your support as we extend our reach even further with our end-of-the-year fundraiser. 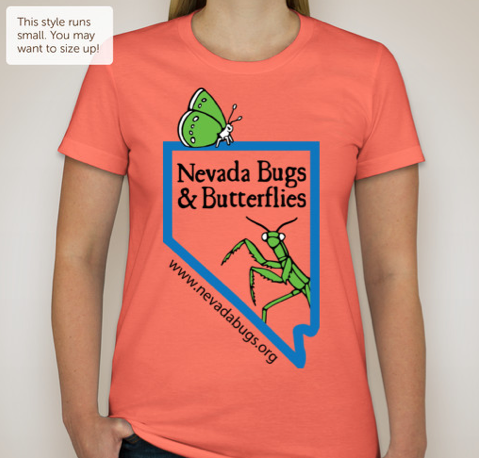 Help us prepare for 2015 by purchasing your own Bugs and Butterflies t-shirt! 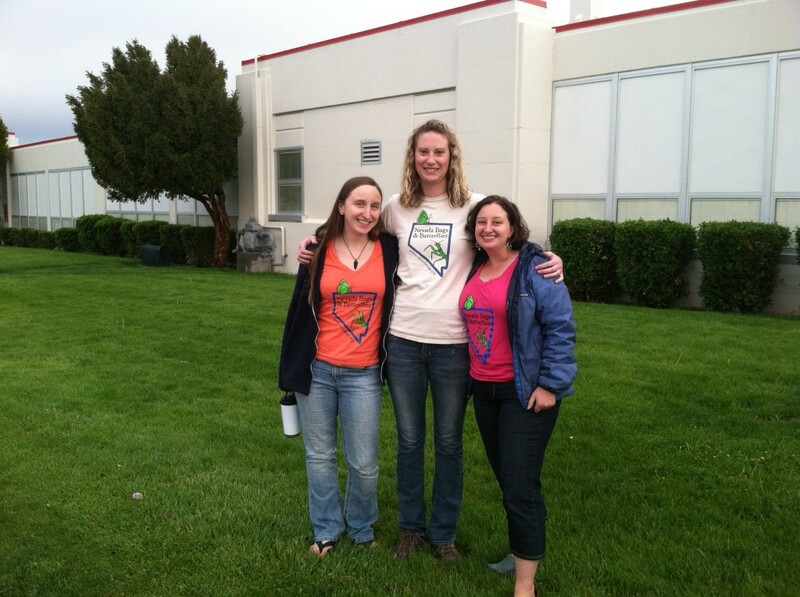 Shirts are American Apparel and are available in men’s, women’s, children’s, and toddlers’ sizes. They make great gifts and will be delivered in time for the holidays! Because of logo scaling issues, adult and children’s t-shirts are being sold through two different campaigns. 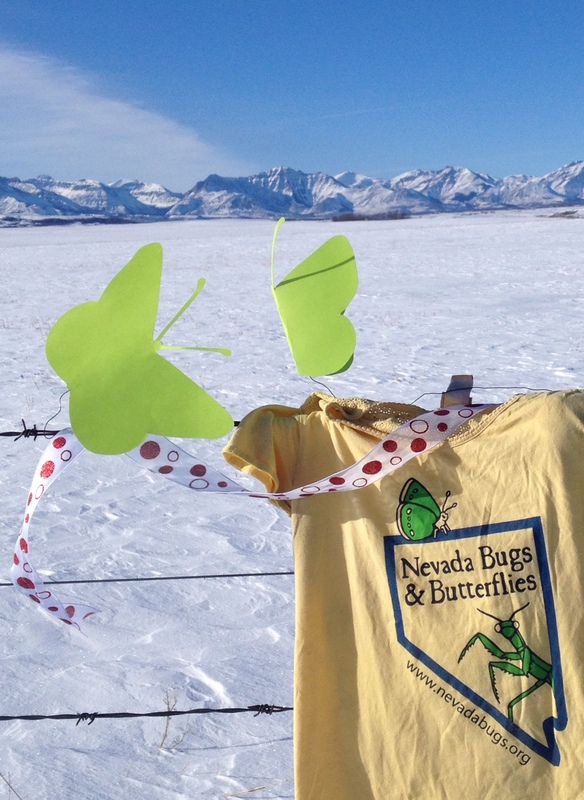 Sure, the butterflies won’t fly again until springtime, but our plans take wing over the winter, when we focus on developing new programming, researching curriculum, training volunteers, and securing supplies for the summer to come. Additionally, outreach in classrooms and community centers continues through the winter months. Your donations allow Nevada Bugs to provide hands-on experiences with Northern Nevada’s native insects all year long! Sale ends December 5th; get your shirt before it’s too late! End of the season approaches! It’s been a little while since our last post here, but it’s only because we’ve been delightfully busy! 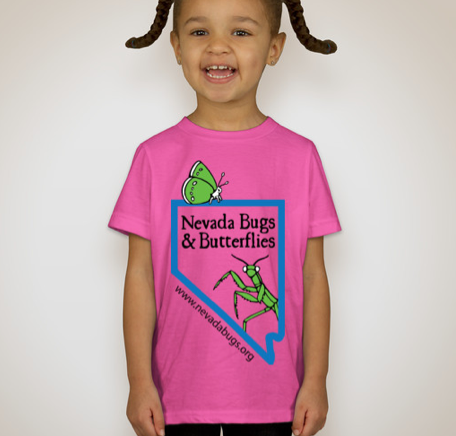 Since we returned from Arizona, we saw 700 people at a set of Washoe County Library visits, and have had a variety of groups and families visit the butterfly house. Of course, the other big news is that the end of our open season is nearing– we have just two weekends remaining, with our last open weekend being September 25th, 26th, and 27th. But, we’re going out with a special event- we’ll be tagging and releasing monarchs on all three of our last open days between 11am and 1pm! 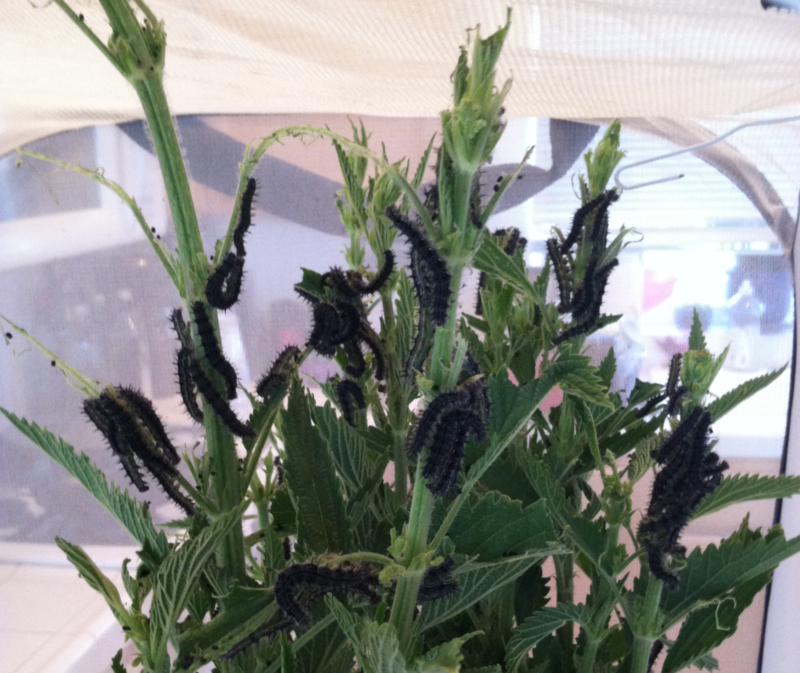 We have been raising caterpillars that will join the migration to the west coast, and we are going to contribute our little bit to monarch migration research by tagging (with small identification stickers) and releasing adults from the butterfly house property. These tags may then be recorded by observers at the overwintering grounds, helping researchers understand where monarchs from our area migrate to, and how long it takes. 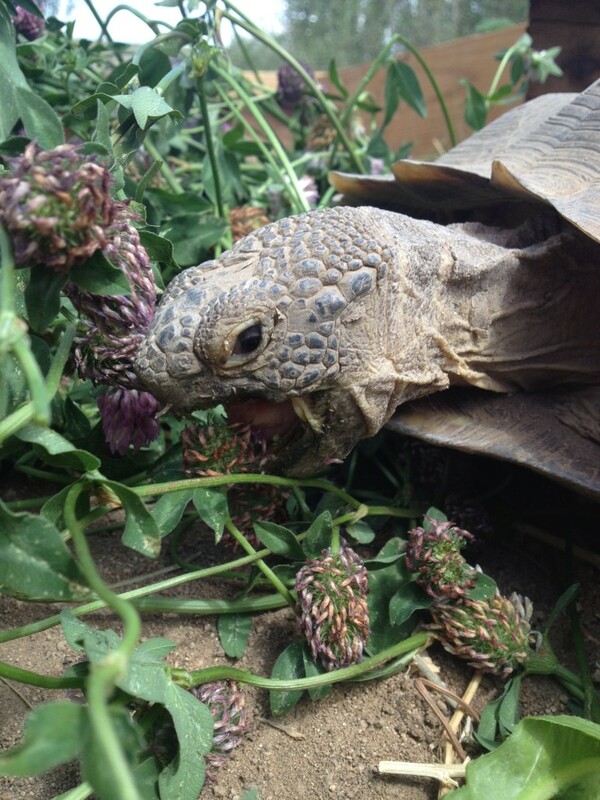 We’d love for you to join us and help us release these amazing creatures into the wild. Sometimes at the butterfly house, it’s just nice to take pictures 🙂 The butterflies make great subjects, and there is always something interesting going on around the garden. 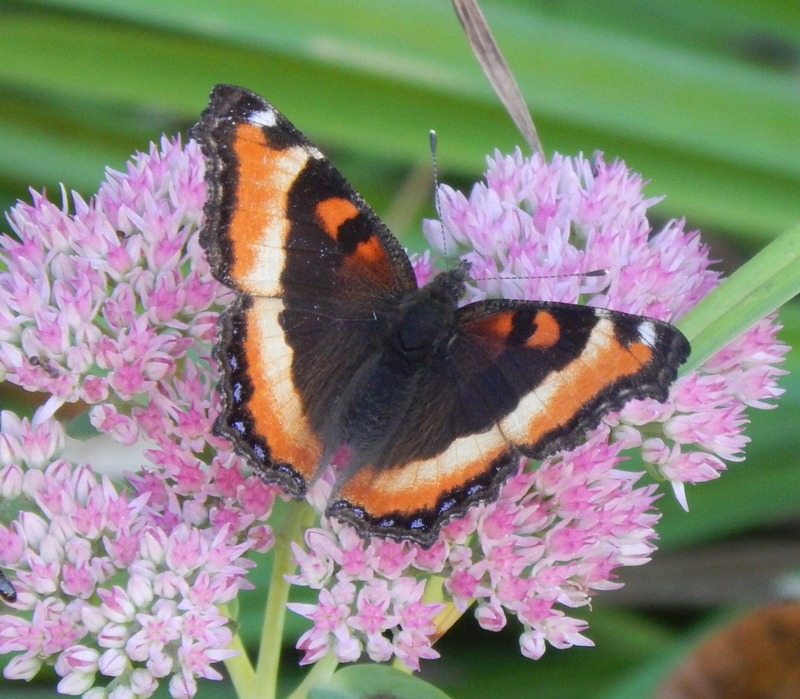 So, without further ado, we present a small portfolio of late summer at the butterfly house. 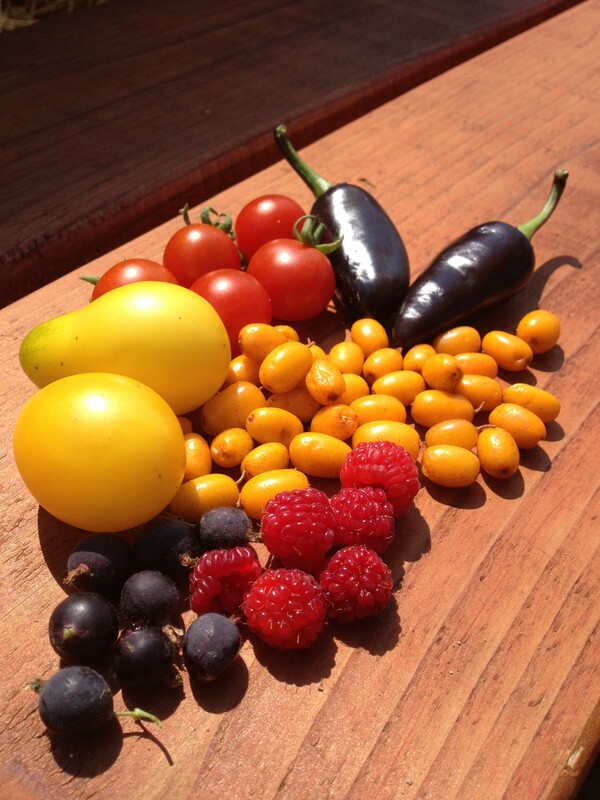 Just a sample of Neil’s gardening handiwork, including grape tomatoes, cherry tomatoes, uber-hot peppers, seaberries, raspberries, and gooseberries! Superfood galore! Mutualism in action! These ants are harvesting sugar water from this Lycaeides caterpillar, and also act as good defenders if a potential predator wanders along. 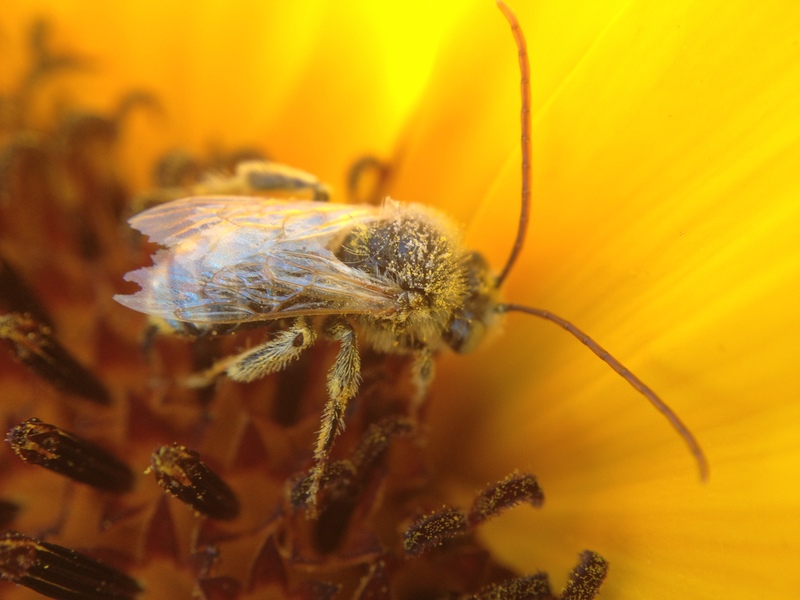 Longhorn bees, a set of solitary native bee species, are important sunflower specialist pollinators, and also use the sunflowers as a resting place. 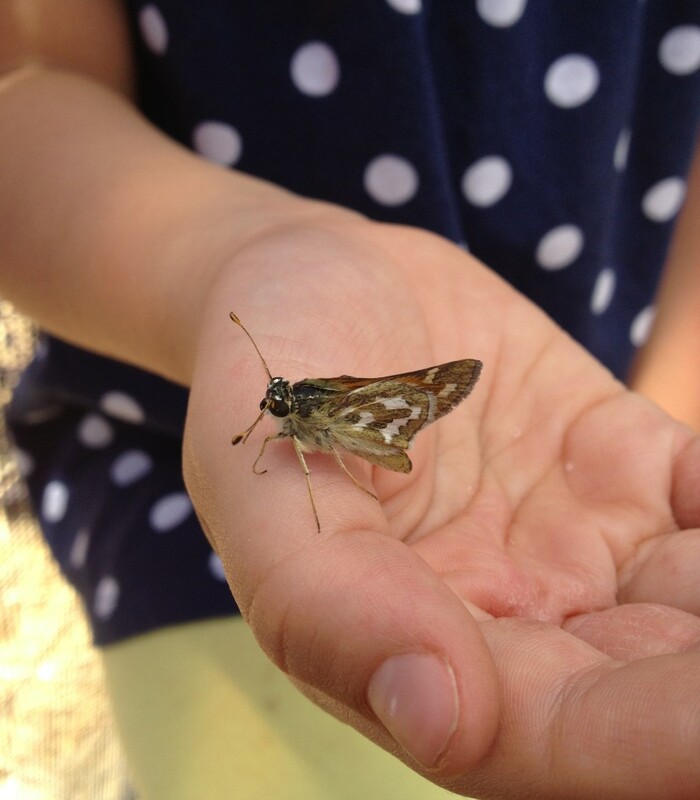 We went mothlighting with the folks at the Tahoe Institute for Natural Science near Boca reservoir and had a great time! 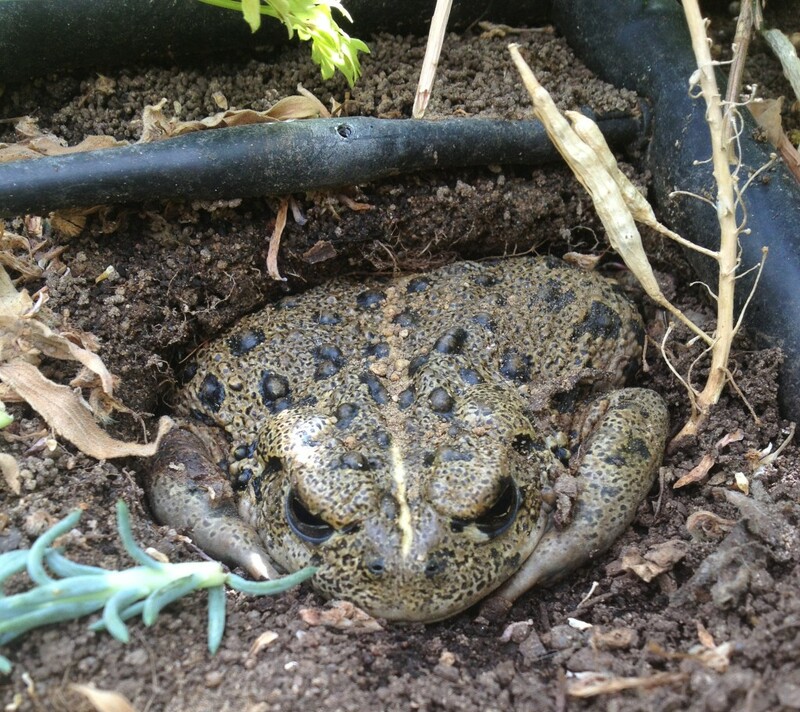 One of our visitors found a western toad taking up residence outside the butterfly house- right under a drip irrigation emitter! 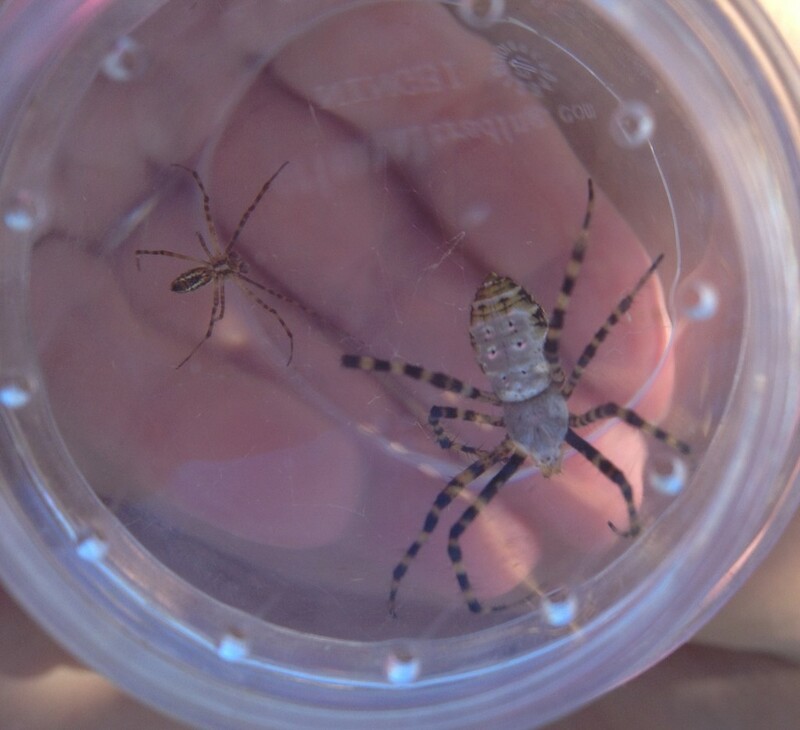 We found this male and female orb weaver together… in our butterfly house. We relocated them outside! The Jerusalem artichokes are in full bloom, attracting numerous bees and flies. 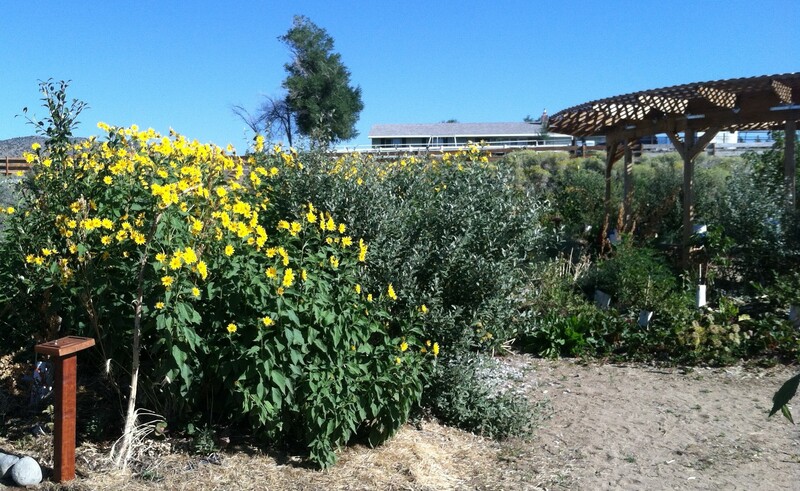 They are a great permaculture plant, providing food for humans and insects. 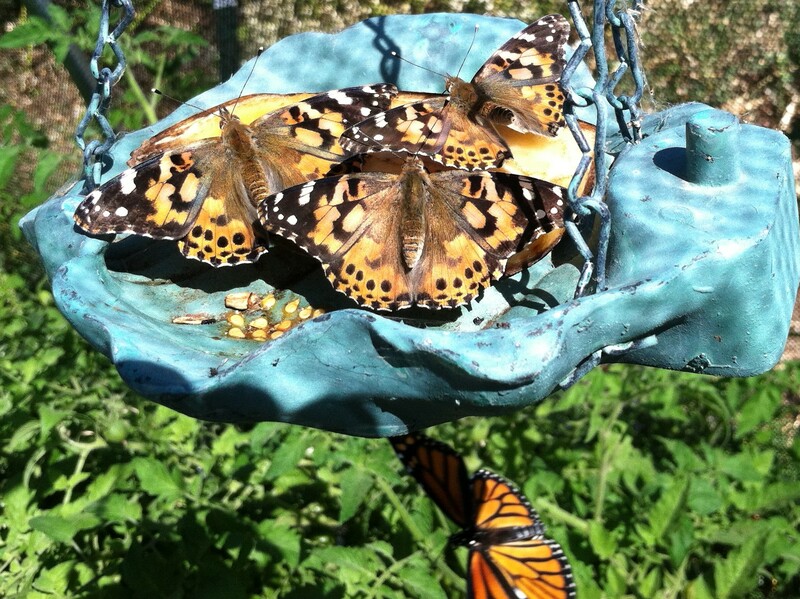 The kids from Triad Elementary came and release 60 painted lady adults into the house, where they basked in the sunlight and dined on old fruit, a favorite of nymphalid butterflies. We’d love to see you at the butterfly house before we close for the winter, so come on out: we’re open 10 – 3 Thursdays, Fridays, and Saturdays till the end of September! Hi everyone! We’re excited to announce our next workshop this Saturday, July 12, from 10:30-11:30 at the butterfly house, with the topic this time being our native reptiles and amphibians. We’ll have two outstanding UNR researchers on site to talk “herps”- Dr. Sarah Snyder is a recent Ph.D graduate of the UNR Ecology, Evolution, and Conservation Biology program and is now a visiting professor for Bard College at Simon’s Rock; and Chava Weitzman is a current Ph.D. student in the Tracy lab working on desert tortoise immune ecology. 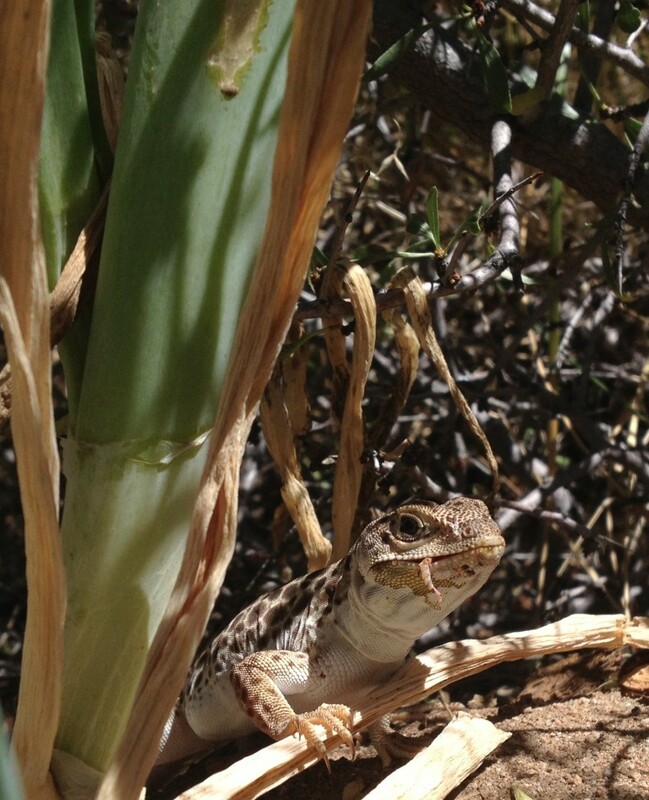 During the workshop they’ll introduce you to some of our native Nevada reptiles and amphibians and discuss desert reptile biology. 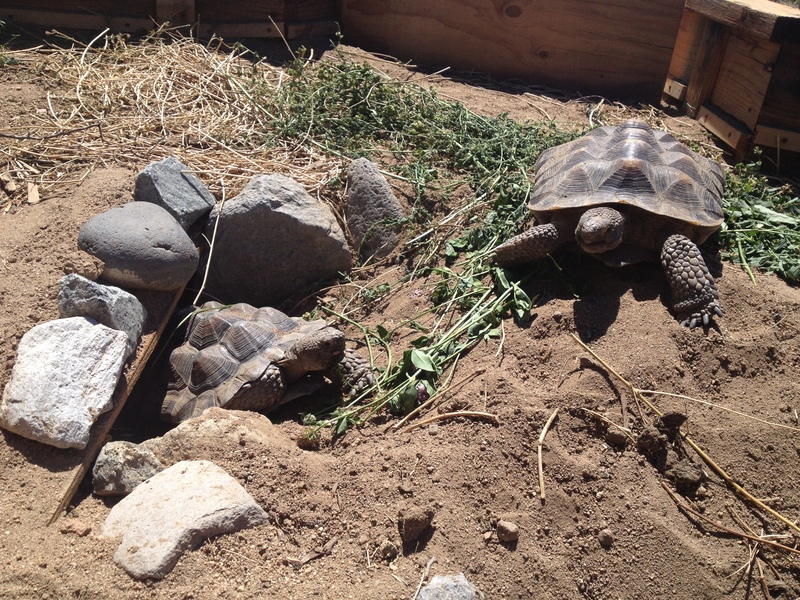 They’ll also have live reptiles to show and touch including native frogs, snakes, and lizards, as well as two desert tortoises that have just moved into their new habitat at the butterfly house! This is sure to be a fun, educational, and interactive time, so come check it out! The weather is much better today, which should make for great butterfly activity in and around the house- stop by and see us! 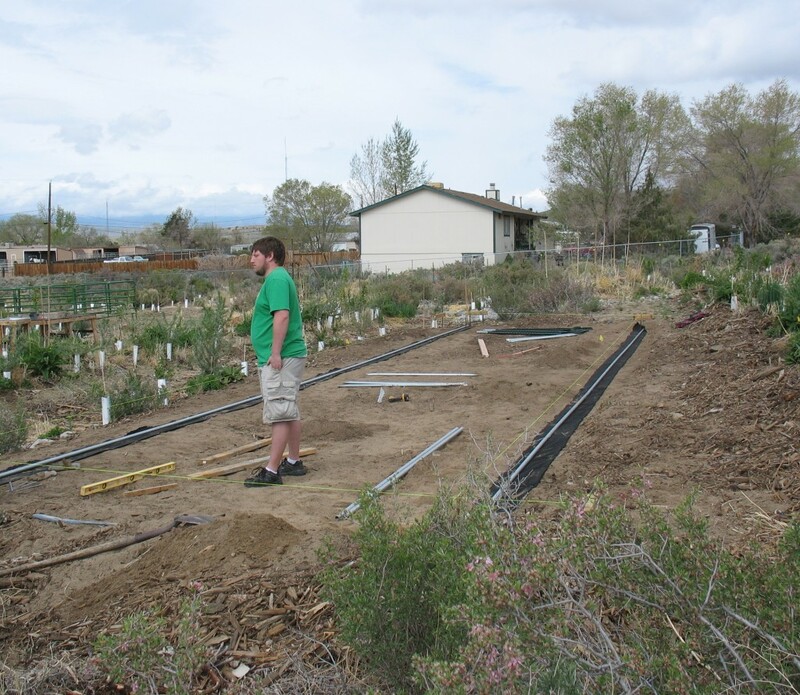 Also, on Saturday, June 28th, starting at 9AM, Neil Bertrando (the owner of our site) will be giving a tour of his entire property, which will include the butterfly hoop house, but will also be much more, as he’ll discuss how his site is integrated into the surrounding landscape, as well as a detailed tour of the permaculture design elements all around the property. A longer description is below; this is sure to be a great time packed full of cool information and ideas. More information details are below. Hope to see you there! With Neil as tour guide, the group will explore the food forest, windbreaks, alley crop, animal systems, and more. We’ll look at the beneficial linkages between these systems, including strategies for water harvesting and conservation, irrigation, soil building and fertility cycling, plant selection and spacing, integrated pest management, accelerating succession, season extension, and phased implementation. You’ll also get a chance to check out the Butterfly House and interpretive trail developed in collaboration with Nevada Bugs and Butterflies. The Butterfly House is stocked with all Native Butterflies and lots of flowering and food producing plants. It embodies the practical application of a main goal of Steppe One Farm: to demonstrate the potential synergy created when agriculture is designed to mimic nature. The hoophouse itself is mobile and adapted from designs by Eliot Coleman and plans at Johhny’s Seeds (http://www.johnnyseeds.com/assets/information/7000movecattunnelbendermanual.pdf). We’re excited to share our experience with this system and many others around the site. Because the Butterfly House has open hours starting at 10 am, parking will be a little tricky. We’re asking you to help us stay organized and to meet both your needs and those of others. If you show up for the tour and plan to stay for the whole thing, please park in the roundabout driveway or along the road on the South Fenceline. You can also park on Fir St. on the North boundary of the site if you want to be able to leave at any time. Please be careful walking on Matterhorn Blvd. because people tend to drive very fast on weekends. It will likely be hot and sunny, so please be prepared and bring your preference of tools to foster a comfortable and hydrated experience: for example, a sun hat, water bottle, and sunblock. 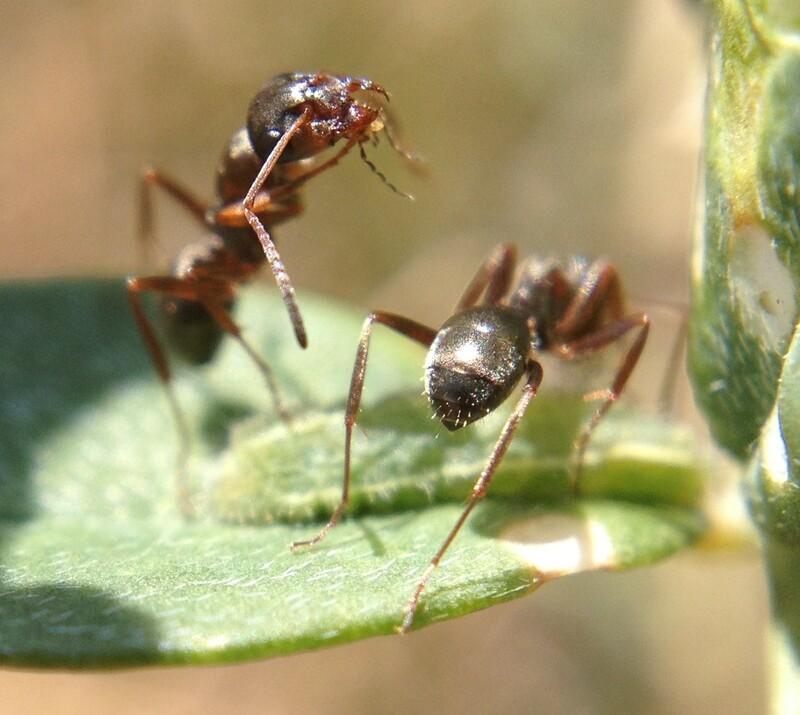 We do have red harvester ants as on-site residents, so closed toed shoes are recommended. We’ll also have Loping Coyote Farms’ nursery plants for sale. Some of the plants we currently have in stock are several varieties of Fruiting Mulberries, Yellow Cornelian Cherry, Purple Cherokee Tomatoes, Culinary Sage, Red Valerian, Comfrey, Creeping and Varico 2 Thyme, Hyssop, Dyer’s Chamomile, Ginko biloba (male and female), Sylvetta, Gold Button Yarrow, and Lemon balm. Most herbs and vegetables are $5 each and most trees are $20 each. We are also offering 5 mixed herbs or veggies for $20. We hope you’ll join us to enjoy the abundant colors, aromas, flavors, and sounds that enrich our lives in the high desert at the beginning of Summer. 2) the butterflies may not be quite as active today. Butterflies like warm, mostly calm, sunny days, and they may not fly as much on days like today. We’ll still be open 10-3 but if you have the flexibility, you might wait till the sun breaks through. You can check the local weather for Lemmon Valley here. And, as always, you can call and ask us if now is an ideal time to come visit at 775-276-1393. Thanks! 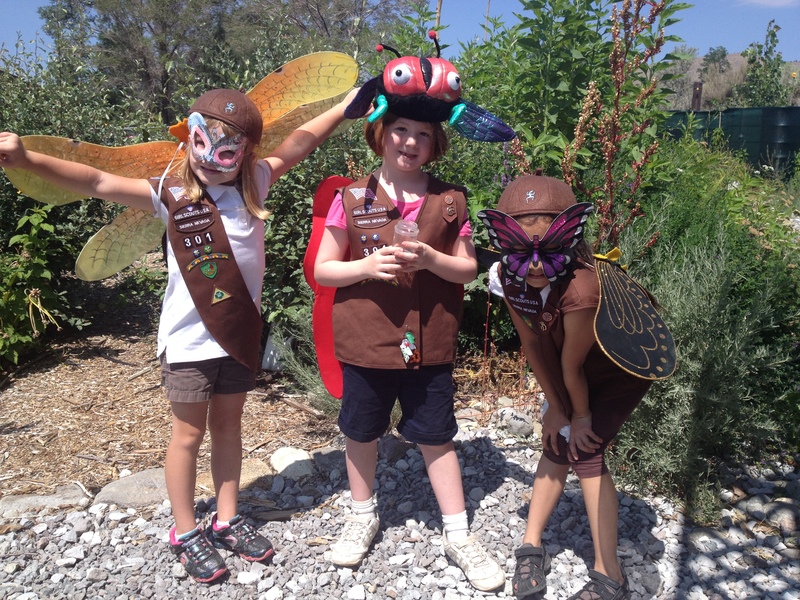 Opening Day at the butterfly house AND community events for National Pollinator Week! On Tuesday, June 17th, we’ll be at the Discovery Museum from 10am-2pm, along with UNR professor Dr. Anne Leonard and her lab, showing off some of our local pollinators and a live bumble bee colony! 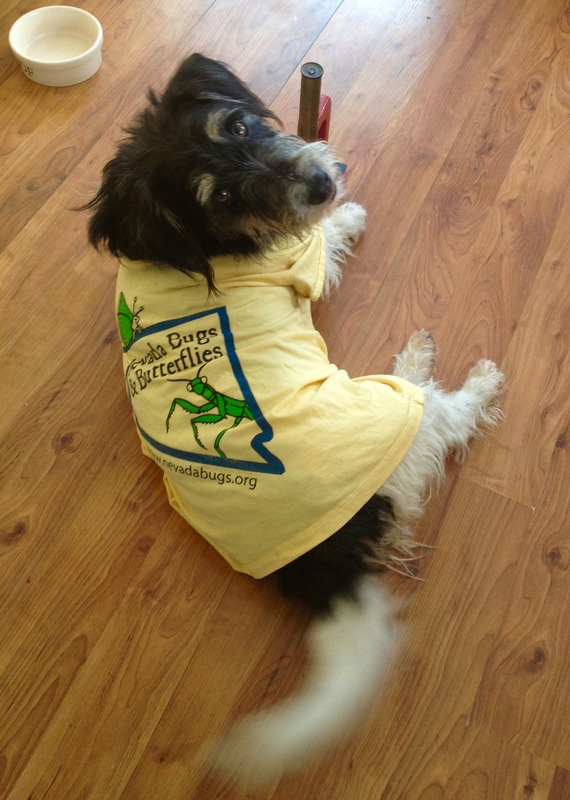 We’ll also have pollinator seedlings for kids to pot and take home (somewhat limited quantity). 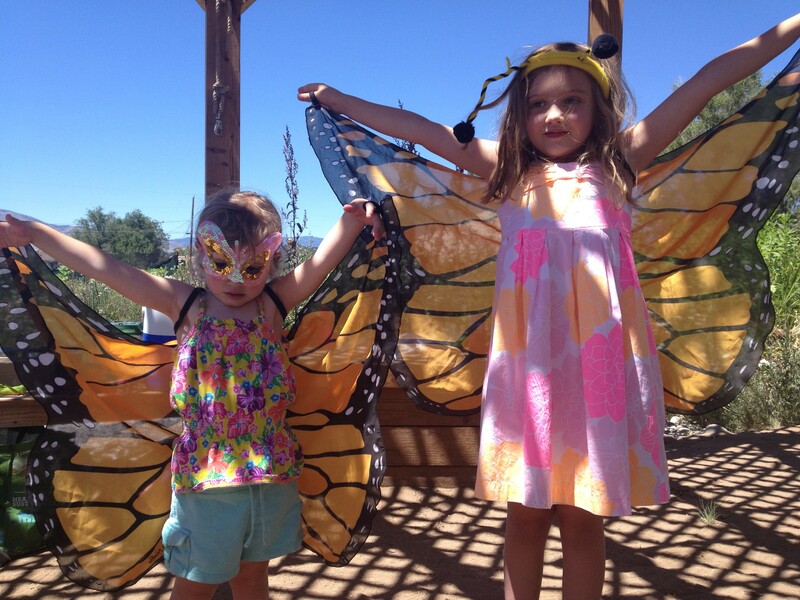 The butterfly house opens on Thursday, June 19th! We’ll be open Thursday, Friday, and Saturday 10am-3pm. 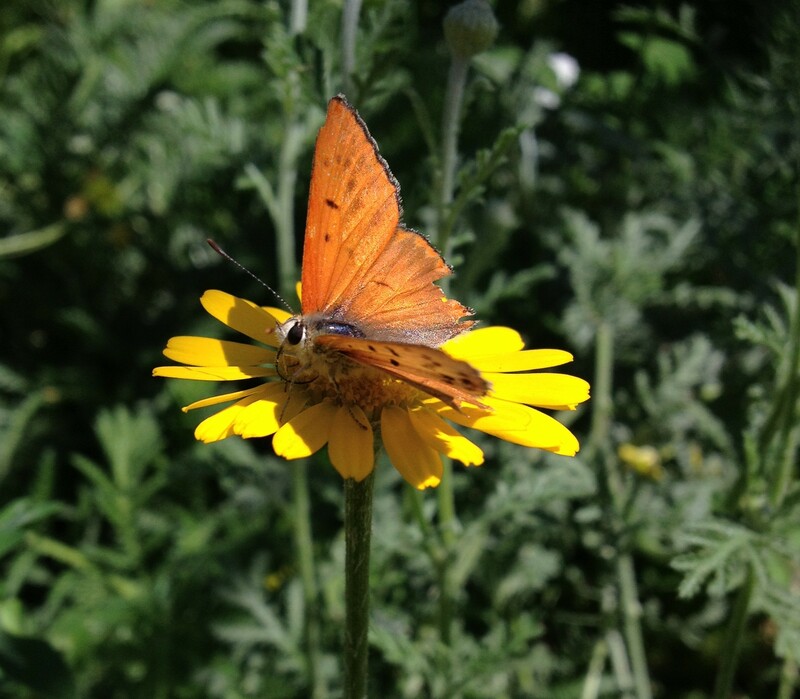 Come see some of Nevada’s beautiful spring and summer butterflies up close, surrounded by blooming flowers and growing vegetables. 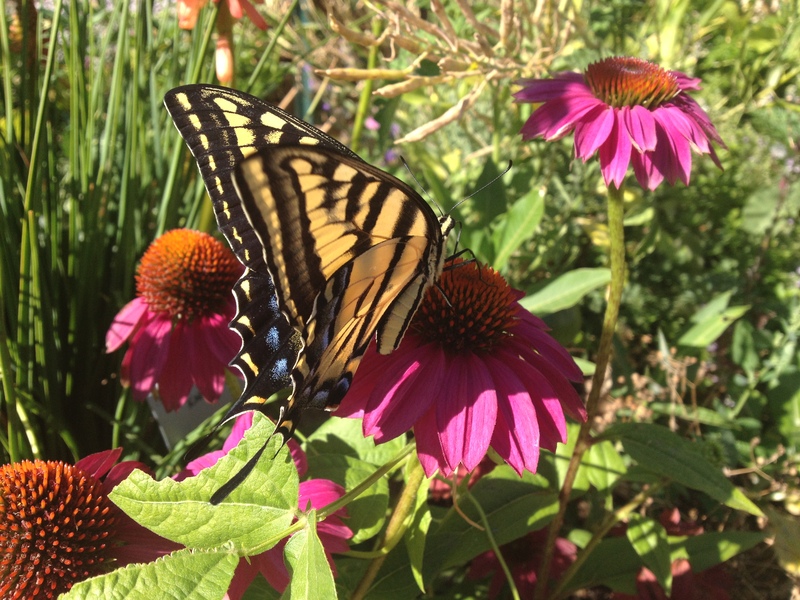 You can catch butterflies, grasshoppers, and beetles on the one-acre permaculture garden, observe many species of native bees, and check out our new wooden interpretive signs that are stationed around the property to learn about plants, animals, and garden landscape. Directions to our butterfly house can be found on the Come Visit Us page of our site. On Friday, June 20th we’ll be at the Great Basin Community Food Co-Op from 5:30-7:30pm, where we’ll have a honey tasting with honey collected from different crops, short films about bee pollination and conservation, and a group discussion about local pollinators with Dr. Leonard. This is a great opportunity to learn about the biology and natural history of bees from an expert doing research on them right here in Reno! 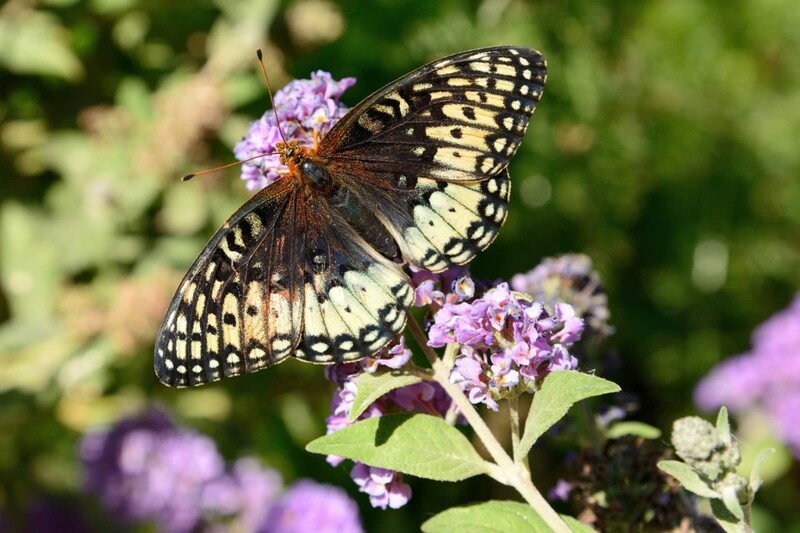 We hope you’ll join us in celebrating your favorite pollinators, be they butterflies or otherwise, all this week and come see us at the butterfly house on the 19th! 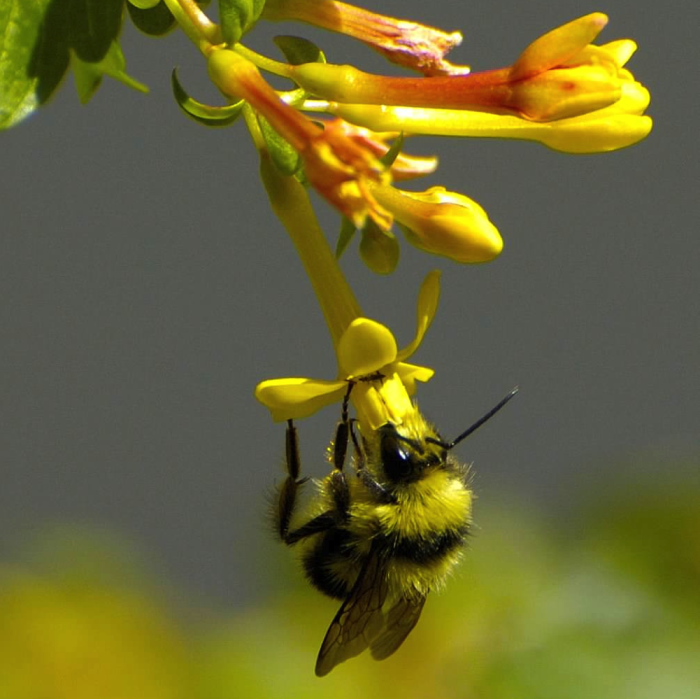 Tubular flowers encourage pollinators like this bumble bee to dig deep for nectar, increasing the chance of the flower being pollinated. 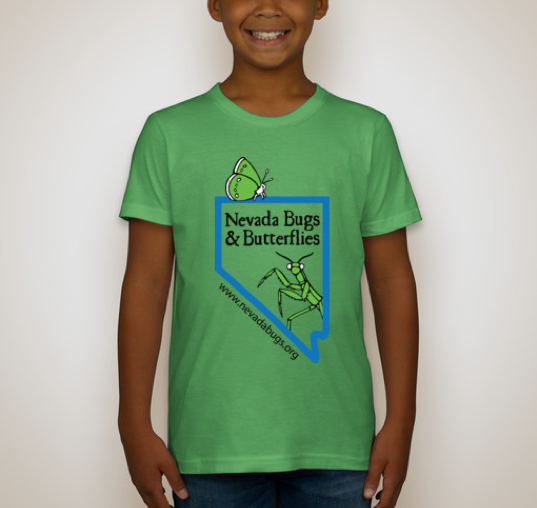 It’s prime time for raising butterflies here at Nevada Bugs; we’re getting ready for our opening day on June 19, and that means we need caterpillars, and fast! One species we’re raising now that you’ll be able to meet on opening day is the Milbert’s tortoiseshell (Aglais milberti), a beautiful brushfoot butterfly with a 2 – 2 1/2 inch wingspan. 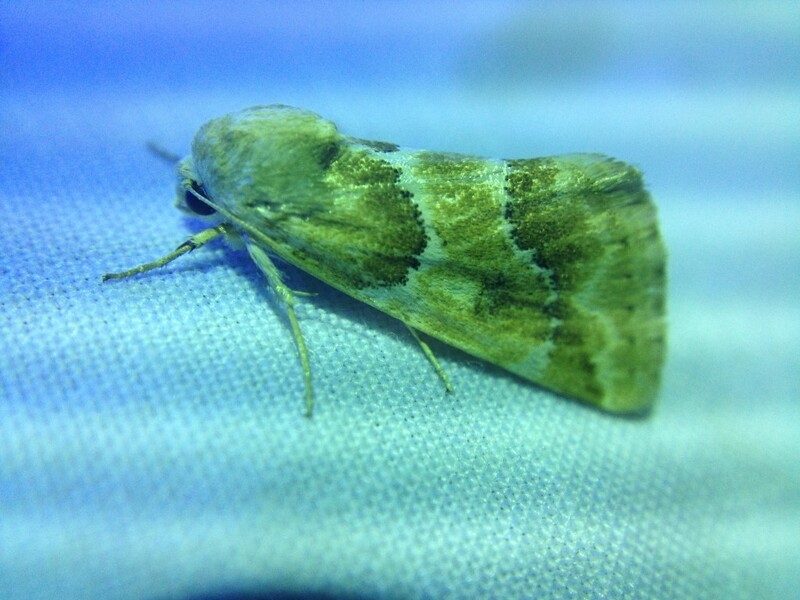 They are a fairly common species in riparian areas, marshes, trails, and occasionally roadsides, and range broadly across Canada and the western United States. 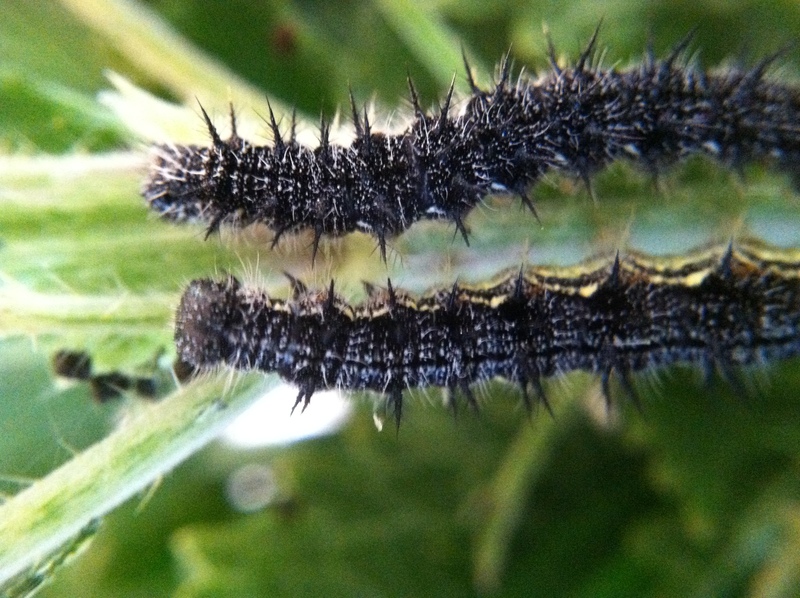 As with many butterflies, Milberts’ caterpillars can eat only a couple plant species, and in this case the most common local host plant is stinging nettle, Urtica dioica. This species is infamous for the painful sensation it leaves if you carelessly brush against it in the woods, and this is likely a good defense against small mammalian predators. We’ve learned to wear gloves when handling these plants! 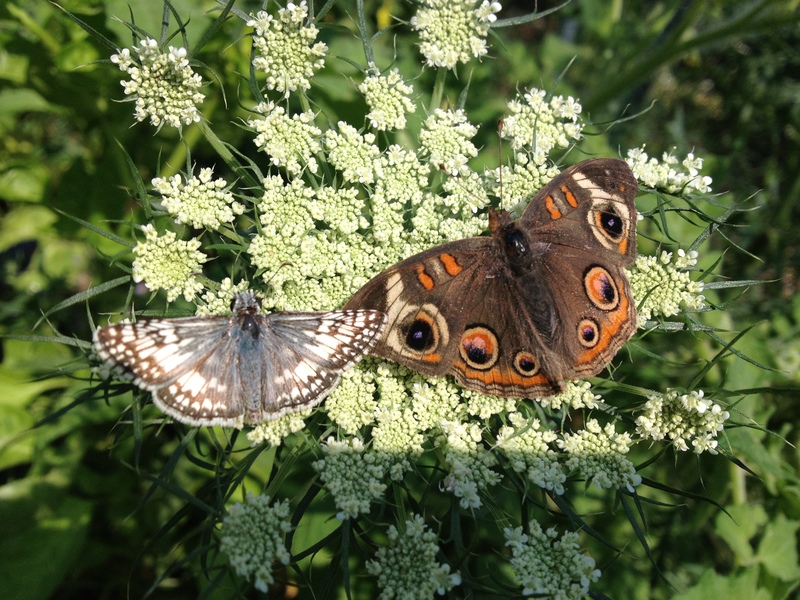 Despite the drawback of handling nettle, these butterflies are a fun species to rear as caterpillars due to their somewhat unusual feeding behavior. 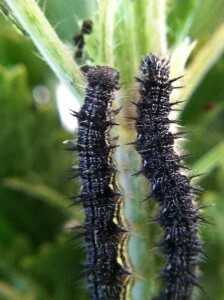 As young larvae, until around the fourth instar, or molt, they feed in large groups, often covered in webbing to protect themselves and completely devouring a plant before moving on. Even as they age, they continue to congregate in groups, though they can form silk nests individually in the wild. 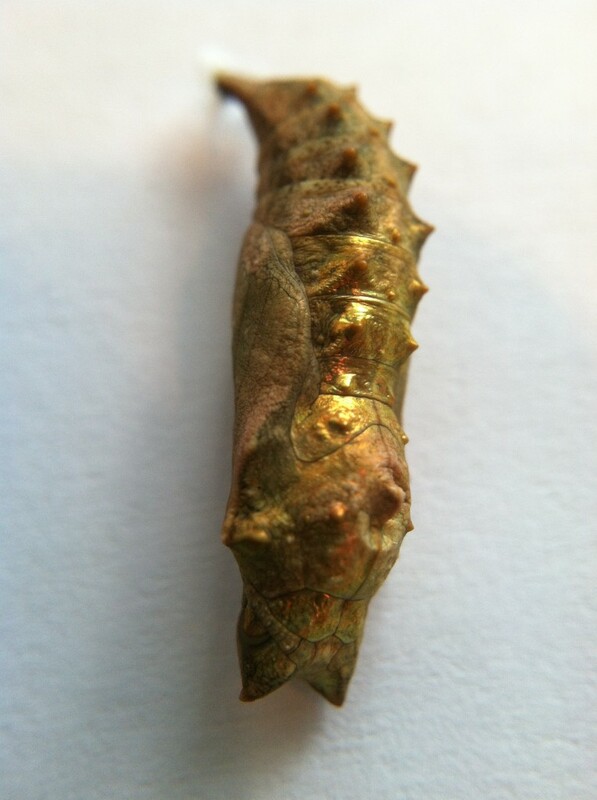 They then leave the plant and wander off to find a safe place to hide and pupate, where they stay as a beautiful brown-green chrysalis with a copper sheen. 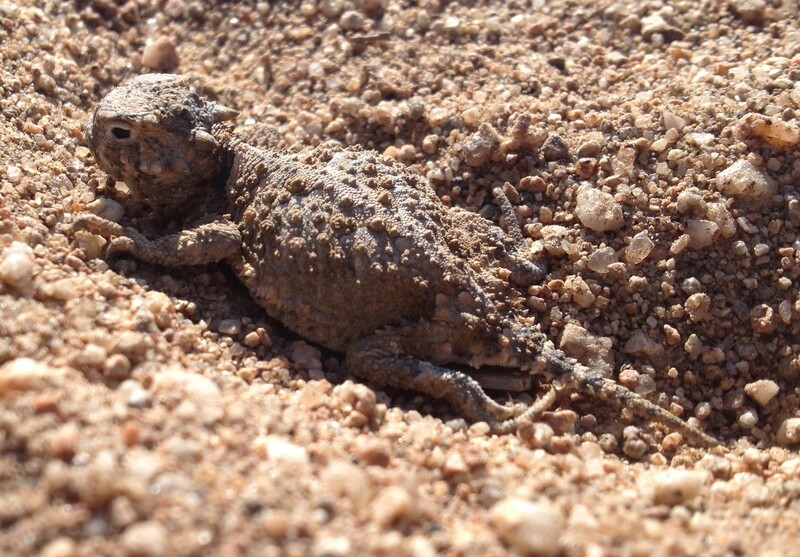 Milberts’ have a rapid development time, going from newly hatched to pupa in under 3 weeks. 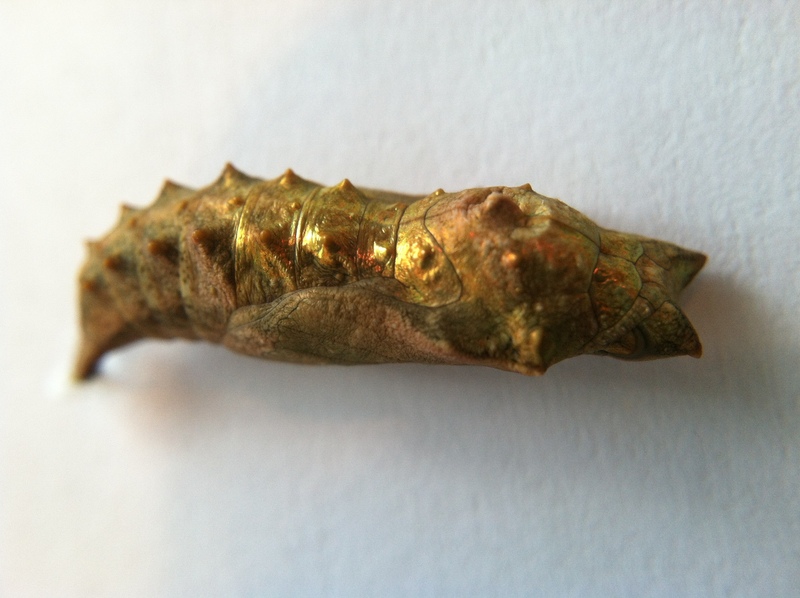 However, after pupation they are a fairly long-lived species, often living over a month. They exhibit two flight generations per year and will be active as adults until perhaps early October, when they’ll overwinter as adults. Be sure to see these beauties on our opening weekend! Spring is in full swing here in Reno, as evidenced by the rainy weather we’ve had these last couple days. Despite that, we’re preparing for the hot summer days we know are coming. For our butterfly house in Lemmon Valley, this means two things- moving the house to its alternate ‘footprint,’ and putting the shade cloth on. 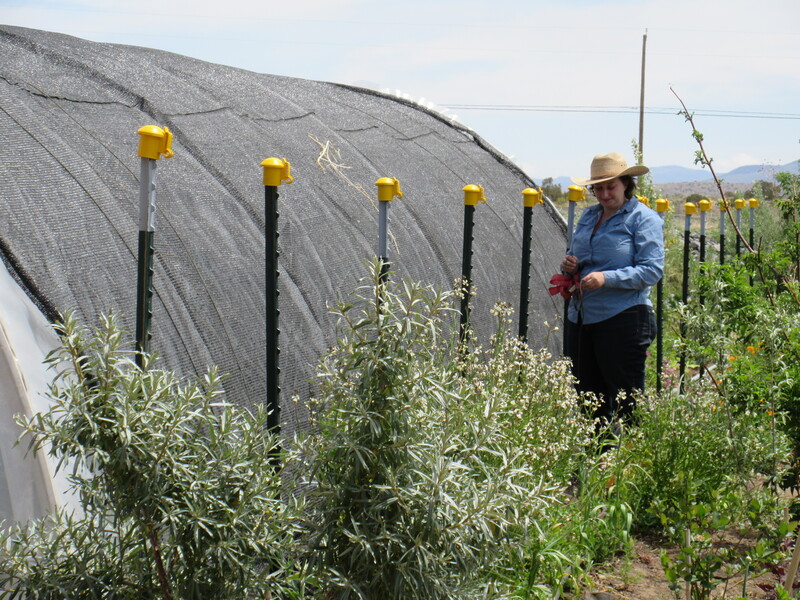 One of the neatest features of our hoophouse is that it is meant to be two hoophouses in one, which it does by being mobile, on wheels and a track that is double the length of the house. 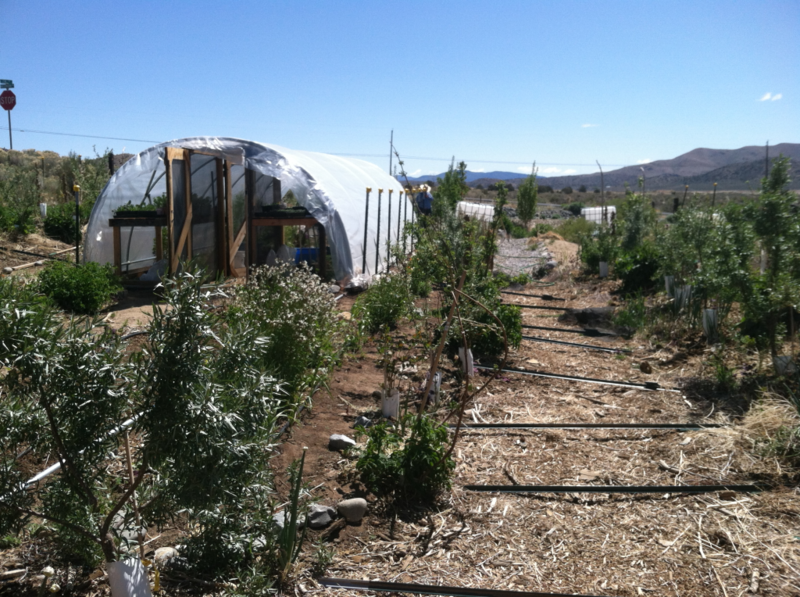 This way, the hoophouse can be on one of two sites, depending on the season. 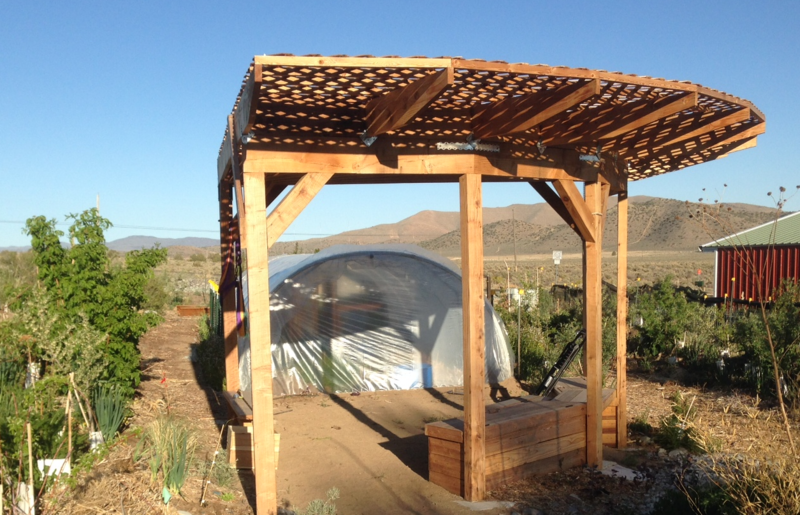 This design allows us to grow cool-weather crops (kale, chard, lettuce, etc.) 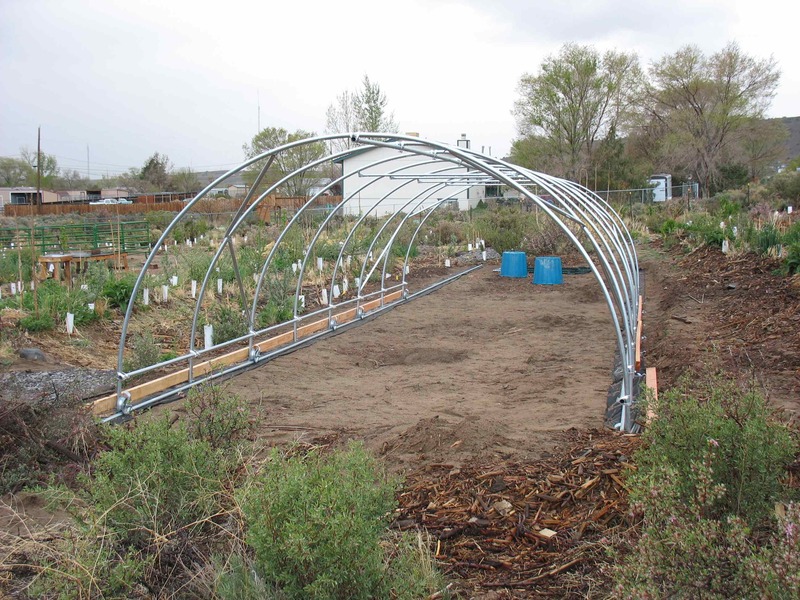 on one side, then move it to the other side to grow warm-weather crops (tomatoes, peppers, melons, etc.) during the summer and the butterfly house open season. This hoophouse is based on the ‘moveable caterpillar tunnel’ designed by Eliot Coleman and the folks at Johnny’s Seeds. Rails being laid down before the hoophouse is placed on it. One of our great volunteers Josh Jahner in the foreground. 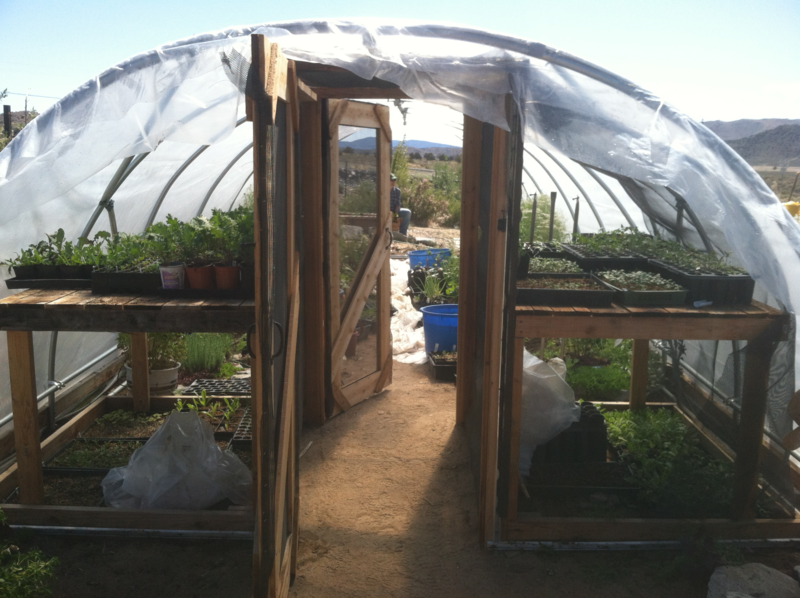 Newly constructed hoophouse, taking up half of the rails. The pergola is not yet built in this picture. We move the hoophouse on the first weekend of May this year. Moving the hoophouse consists of detaching it from all its anchor points (not shown above), cleaning the tracks of debris, moving all the delicate plants out of the way, taking the plastic off the sides of the house, and slowly moving the house to the other side, being careful not to rip any of the fabric or plastic in the process. It is slightly delicate work, but it went off without a hitch. After it’s in the new location, new anchors (t-posts) are hammered in and the plastic is covered at the base to seal the house in. The next step is planting pollinator plant seedlings for the butterflies in June and warm weather crops to grow through the summertime. The following weekend after moving the house, we put the shade cloth on over the plastic. Those of you who visited the butterfly house last year may remember the whole structure being shade cloth, but we put a heavy UV-resistant plastic over the whole thing for the winter to grow those cool-season crops as soon as possible. Now that summer is approaching, it can get in excess of 90 degrees in there, so it’s time to cool things down a bit. For this, we simply unrolled the shadecloth over the plastic and tied the whole thing down with parachute cord. Soon, we’ll take the plastic off the sides entirely and replace them with shadecloth to increase ventilation and further moderate the temperature for the butterflies during the summer. These are two of the biggest spring transition activities for the hoophouse- after we plant seedlings in the house, all we have to do is wait till early June to start stocking the house with butterflies. One more sign that summer is quickly approaching!